Mrs. Xu is a 64 years old lady from Ho Chi Minh, Vietnam. No one would relate her with cancer when looking at her bright smiles. However, there is always rise and fall in a life. This happy lady found a lump in her left breast on 2004, which she did not pay attention to at that time. 1 year later, she noticed that her lump grew bigger and was urged by her family to have examination in local hospital and was diagnosed breast cancer. When she was shock by this bad news, doctor suggested her to have surgery as soon as possible. In order to keep her female feature, Mrs. Liu refused the suggestion and looked for other treatments that actually did not work on her at all. The whole family was in panic and lost when the lump increased to a fist size. This happy family lost its laugher gradually because the patient doesn’t have right treatment. 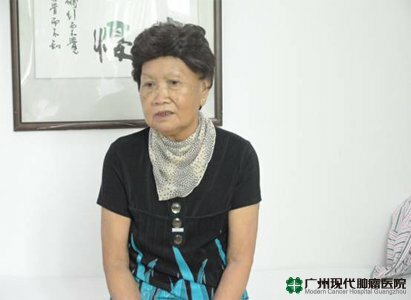 One day, her daughter-in-lay read the report about the new treatment mode in Modern Cancer Hospital Guangzhou: Minimally invasive and target therapy with combination of traditional Chinese medicine. This new mode in cancer treatment took away all Mrs. Xu’s attention. But thinking about the economic condition of her family and therapeutic effect, she refused to take the treatment. 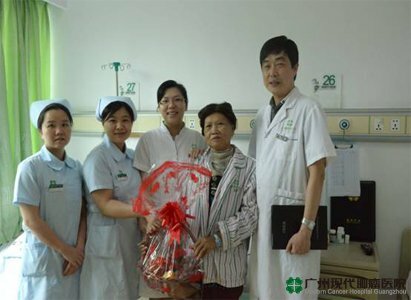 Just then, Mrs. Guo, a patient who has ever been treated in Modern Cancer Hospital Guangzhou shared with Mrs. Xu about her the treatment experience. Mrs. Xu went to Guangzhou, China for treatment because her family insisted on that. After her admission on May 31, 2012, Mrs. Xu went through a series of examination and was diagnosed left breast cancer. The specialist form Modern Cancer Hospital Guangzhou planed a comprehensive treatment for her after general consultation. Dr. Ma Xiaoying came to the ward of Mrs. Xu with interpreters to explain her case, treatment and therapeutic effect patiently one day ahead the treatment. Besides, Dr. Ma also comforted her and asked her to keep a positive attitude to fight the cancer. The words of Dr. Ma encouraged Mrs. Xu greatly that she thought she can trust the doctor and the hospital. Condition improved by taking treatment positively. Cancer Specialists performed 2 cycles of interventional therapy and the tumor shrank through CT scan after treatment. During her hospitalization, doctors and nurses kept their eyes on her condition and took care of her other living, diet and physical problem. Her condition and mental status also improved under the excellent treatment technology and nursing care. The pain which tortured her for long also relieved and her sleep got better. She even returned to the happy lady as before to talk to other patients in hospital, shared with them her experience about treatment and took part in the tour and shopping activities held by hospital. Though she is still threatened by cancer and the road to fight cancer is long for her, Mrs. Xu said, she won’t give up and would be more confident to fight against cancer.